In times of decreasing defence budgets and shrinking fleets the need to adequately and effectively respond with naval forces poses a challenge for nations and the Alliance. This challenge is ever increasing as the frequency, magnitude, and complexity of crises and conflicts worldwide demand naval forces that are prepared for any mission at any time. Modern training technologies like the use of Live Virtual Constructive (LVC) entities within Synthetic Training Environments are already proven means in some Navies for complementing maritime live exercises. Virtual training environments strengthen combat skills and increase force cohesion before deploying to operations. The United States Navy’s Fleet Synthetic Training program is the most prominent example, underlining that there are already a number of nations experiencing the benefit of synthetic training events. 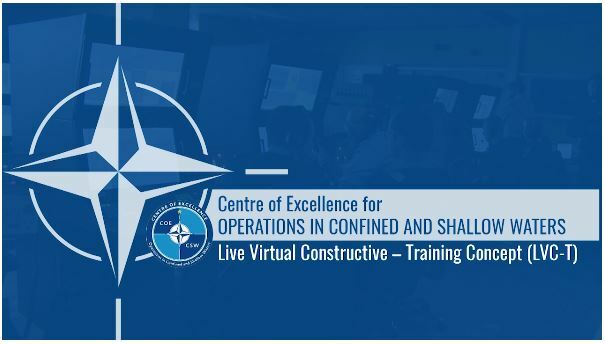 In consequence the NATO Training Group requested the COE CSW via the Headquarters Allied Maritime Command to develop an LVC training concept for the maritime domain. This concept describes how the Alliance could utilise synthetic training to improve readiness and increase interoperability of maritime forces. The LVC technology will provide multiple further forms of application such as tools for evaluating the performance of both staffs and forces during exercises, or as a test bed for experimenting tactics, techniques, and procedures. The concept aims at implementing cost-effective, commercial-of-the-shelf technical solutions and pre-established standards for connecting simulators ashore and combat systems aboard. The initial focus of this venture will be to provide an LVC platform for the Standing NATO Maritime Groups. Another important and mandatory condition is the development of realistic synthetic scenarios. In effect, this means that the training audience should be faced with challenges comparable to any live operational environment. In this context, the LVC must meet the ultimate requirement TRAIN AS YOU FIGHT!